Amid helicopter gunships overhead, men danced and Afghan National Army troops marched during a Kabul ceremony on Wednesday to mark the 1992 toppling of the Soviet-backed regime. The former Soviet Union, which once shared a border with Afghanistan, invaded Afghanistan and installed a puppet regime in the capital of Kabul in 1979. A long, weary guerilla war between various Afghan resistance groups and Soviet forces ensued. In 1992, the mujahedeen declared Afghanistan liberated. The Taliban gained control a few years later. The Wednesday ceremonies, which spectators and government officials attended, also included a 21-gun salute and speeches. It was held at a sports stadium in the central part of the city, which was used as a public execution ground by the Taliban regime from the late 90s into 2001. Afghan President Hamid Karzai is attending a summit in Bhutan. In 2008, the ceremony was marred by an assassination attempt on the leader. Long live Afghanistan and Afghans!!!!!!!!!!!!!! This is not the celebration of getting rid Soviets OUT. Infact they are rehearsing for the forthcoming celebration which they will do after they throw out their current enemies occupying their land. if you don't know the past, then you are condemned to repeat the future. Folks, this isn't about freedom. This is about fuel. In Afghanistans case, natural gas. In Iraq's case oil. For more information go to wikipedia / britannica and search the past events and compare / contrast them to current events. Afgans, STOP celebrating the Victory over the Russians when you can't even fight for your countrie's independance from the Taliban and Al-Quaida!!! You losers should be ashamed at the fact you couldn't control or beat LOSERS like the Taliban "The Students Of Ignorance. Why don't you just do what you really want and kick all these Terrorists out of your country and stop selling dope. Your an embarassment to this planet and I for one would think that maybe you don't deserve a country at all!!! You also had the chance to catch or kill that POS Bin Laden but decided to chomp out!!! Daniel-2, if you are right, then the North Vietnamese never defeated America either, America withdrewed, and by 1975, the South Vietnamese government were left on their own. Seriously, in the case of Afghanistan, there is absolutely nothing financially attractive to a superpower about the place in modern times, and while the Bush administration had abused power in many ways, toppling the Taliban was necessary, You have not seen what these extremist Wahabbist are doing throughout the Muslim world. I HAVE. They are radicalising Muslim people all over the world. In south-east asia, where a moderate form of Islam is practiced for centuries, wahabbist preachers are going around opening madrasas teaching muslims to shun and sometimes harass and kill non-muslims. Right now even some university professors are teaching that the holocaust never happened. Unfortuantely, a lot of these emanate from Saudi Arabia, and since that IS the centre of Islam, the US cannot allow that state to fail, otherwise you will get a conflict throughout most of the Muslim world that will make Iraq more forgotten than the Korean War. Like it or not, the western world have to defeat the Taliban and ppl in the west better get used to the idea that in war, lots of ppl die because you are up against another human who is going to be smart enough to kill you regardless of how much armour you have, and many mistakes will happen regardless of how well planned your operations are. I agree that Afghanistan is at best going to end up as some sort of tribal democracy, but that is probably what Afghans can work with and live with and probably even die for...All these would have been so much easier if Ahmad Shah Massoud was not assasinated by Al Qaeda. Actually there was never any "victory" over the Soviets as the right-wing news media so claims.The war then was fought to a draw and Mikhail Gorbachov made a unilateral decision to withdraw from Afghanistan leaving the Najibullah government to fight on it's own.Like the Russians before us,we too,have no legitamate business in Afghanistan and have a moral obligation to vacate that country. I agree with ahmed. For today's situation of Afghanistan Russia and US are responsible but even more are the Arabs. The afghan people are too proud and will never let a America change their way of life and their freedoms just because we say so. They humiliated the soviets because it is their ground, their home. And thus they have and will humiliate America. Their society views freedoms and morals differently than our own. There is no moral obligation. If we do have moral obligation it is to respect the morals of another sovereign country. The world is not black and white. Hey Obama, respect their reality, get the hell out of Afghanistan, and proctect our borders while progressively improving our infrastructure. Hamed, I pray for your soul. You are obviously a terrorist, Taliban or drug dealer yourself. I would guess you beat your wife, if you have one, & keep your daughters from education so you can sell them later to your little uneducated, extremists, pratice their wedding night on each other friends. You & your kind are the problem. You spread hatred & incourage violence. Do something constructive & good & help bring peace to Afghanistan instead of spreading hate. Yes it is good to see the Afghan people & military & police celebrate, it will build confidence in the government & promote confidence among the services & build trust between the police, military & the people. I pray GOD will bless Afghanistan with peace & prosperity. May GOD bless & keep us all !!!!!!!!!!!!!!!!!!! I believe no one really understands the Afgahni situation. Afghanistan is a proud nation that has continuously been prey to greater powers over the course of history. Afghanistan, like many other great nations, have been at the center of a geopolitical "greed" war. Fortunately because of the great pride and resilience, the Afgahnis have prevailed and will prevail again. The Afghanistan nation is made of many tribes that have fought for survivial. Historically, the tribes have not been able to get together. One of the biggest reasons is the mountainous terrain and lack of communication between tribes that enables them to come together. Another big reason is the greed of greater powers continuously trying to take over the proud nation. Although a difficult process, we should give them time and all the support they need to achieve unity between themselves. Bickering over who is right and who is wrong is just a waste of time. Whether the U.S. supported the Mujaheedeen or the Taliban is not an issue right now. Rather then trying to make an unnecessary statement, how about providing economic support. Can you imagine trying to live off a land that has continuosly been bombarded? In a land where crops are hard to grow? Also, trying to sell your crops in an infrastructure that is non-existent? Come on what would you do to survivie. For them poppy growing may be the only immediate means for survival. Give them a chance by sending them financial support rather then spending unnecessary funds in weapons. Afghanistan can only have a tribal democracy, if that word exists in their dictionary. US will only facilitate fragmented Taliban government supported by Pakistan. The reason why US entered Afghanistan will thus remain mired in spread of terrorism from Af Pak. As I well remember,back in the 1980's how the right-wing news media lambasted the Russians to no end and now how they tout the NATO as "great liberators".In fact,neither scenario is true.Both represented foreign rule and in truth the Russians were not the demons nor are the NATO forces of today the living saints the right-wing media makes them out to be.So much for right-wing propaganda! Afghans were victims of cold war politics. The current condition of Afghans and particularly Afghan women is a far cry from pre US intervention in Afghanistan, Not perfect but Afghanistan was much progressive and secular. US and the West have a moral obligation to stay the course in Afghanistan. Whether Soviet ouster is a cause for celebration is debatable. Why are people saying that Greg disagreeing with Stanislav's comments on the impossibility of helping Afghanistan is also a denial on Greg's part that the US assisted the Muj in the Soviet Afghan War? Yeah we supported the Mug through the ISI. Yes much of that money went to Islamist groups and some of that probably went to the Afghan Arab groups including Bin Laden (though try getting Bin Laden to admit that). That has nothing to do with the point that most Afghans want a stable nation that they can raise their kids in. Good for the Afghans in kicking out the Soviets. Bad things happened there before and after, but kicking the Soviets out was one hell of an accomplishment and despite outside support the fighting and dying was mostly done by the Afghans. They should be proud and celebrate the anniversary of the Soviet withdraw. The only enemy of the human race are Jews and Pakistan, get rid of both countries and you wil find the world a better place. kill a jew wii help the enviorment. Sorry I do not agree. The Afghan government is not trafficking narcotics. The problem with eradicating the poppy farms in Afghanistan is twofold. First the Taliban encourage the farming of poppies because they can tax it and therefore they do not interfere with the farmer and second, because there is simply more profit in opium production than corn, wheat, etc. Most of the sales of finished opium products come from Pakistan. If Leonid Brezhnev acted wisely back in 1979,and arranged for a surrender of then Communist government to the Mujeheddin the tragedy of the Soviet occupation could have been averted to the chagrin of the Reagan administration. The US situation in Afghanistan is not identical to the Soviet situation so it is inaccurate to simply state that the US effort will fail because the Soviet effort failed. The US and its allies enjoy stubstantially more support among the Afghan population than the Soviets ever did. More simply put, a majority of Afghans would like the US to succeed whereas virtually no Afghans wanted the Soviets to succeed. The only point Stanislav displays is the one on the top of his head. First, the US did not support the Taliban, They supported the mujaheddin. Osama was part of this group yes. But the main point to make is the US, after the soviet failures, packed their covert bags of operations and moved out of the country, leaving a vacuum which was filled by the Taliban. Also note, Osama is not Taliban. The Taliban, as is common Muslim practice is to not betray your guests. With this in mind, the Taliban did not surrender Osama, even when we all new what he was doing or at least trying to do. Osama made no secret of it. Hell, he declared war on the US openly in 1998. Greg's point is obviously the correct one. The idea that Afghans are still trapped within a Taliban envelope is just wrong, and would indicate, as Abraham Lincoln once said, (paraphrased) lets us not minimize the contributions of these fallen soldiers lets we make their deaths in vain. So, Greg, kudos to you and your service to our country and to the afghan people. I have faith in the power of change. Establishing democracy through war is nothing new: AKA Germany and Japan. I am sure Stanisly's views could be found in other detractors after world war 2. Luckily they were wrong, as I believe Stan is wrong now. india=1 billion idiots. stinking fool like mammohan lal show what india is about. nothing. hot air. now go put on some deoderant. When we pull out the governemnt will fall & this country will revert back to warlords. This was is about Globalization (NATO/US) vs. Nationalism (Afghan people). These are the wars going on now to make us a one world governement. I was taught a one world govt.would come from the left–but it's the right it's coming from–big business. This country has natural resources–look at China's investment there. You guys are not smart. It is inevitable that Afghanistan and Pakistan will be swallowed by India. Maha Bharat dream will become a reality. India is smart. First we will train the afghani army and then Pakistan will be attacked from both sides just like how Poland was attacked and captured and then India will conquer afghanistan too. USA and allies will help us in return of our protection extended to them. We will built Somnath in afghanistan to get back what ghaznavi. We will protect USA and allies. yeah manohar lal how bout those 75 policemen masaccered by ur commie guirillas.. or the gujrat terrorist modi whoz roaming free.after a genocide . or Bajrang dal terrorists who after burning alive graham steins the aussie monk stays free.. u have many problems in ur land than poking nose in afghanistan.. I am an Afghan and this was not a victory of Afghanistan and Afghans, it was the day when our people started suffering , going to others country and we were so humiliated ..
"The former Soviet Union, which once shared a border with Afghanistan, invaded Afghanistan and installed a puppet regime in the capital of Kabul in 1979"
That's one way to put it. another way to put it "the Soviets invaded because the U.S. puppet, Amin, had overthrown the Soviet-friendly government of Taraki." Stanislav may have a point about the way things were but a Colonel in the Marines, on the ground right now, has a more current perspective. We did not support bin Laden we backed the Afghan Mujahadeen. Some of those Mujahadeen became the Taliban and some fight against the Taliban. Much of what has happened or is happening is based on the tribes and their beliefs. Keep in mind, Afghanistan is still a very tribal society. No one has ever conquered Afghanistan but you can try to change it for the better. Our effort now is to secure the population and get buy in from the tribes. Once we do that and get the Afghans to root out corruption the Afghans can have a more stable government. USA and allies need to learn from India the art of fighting the guerella warfare. They should request India to teach them how to fight. Indian experience from Kashmir that we are occupying can be a great lesson for all the American and ISAF soldiers. Dear Greg, for someone who is "obviously not an expert of Afghanistan", as you put it, Stanislav seems to be more on point than you, much as I hate to say it. It has been clearly shown that we were in fact supporting (training and financing) the likes of binLaden and other unsavory characters to help get the Soviets out of there, based on the short-sighted enemy-of-an-enemy-is-our-friend principle, which btw keeps biting us in our backside. Greg, you should search the name, "Sibel Edmonds" ( who worked as an FBI translator). You would find that, indeed, Stanislav is correct in his asumption the the CIA funded bin Laden and assisted in the training of vaious afghan resistance groups in order to boot their ideological enemies, the Soviets, out of Afhanistan. We actally carried very close relations with bin Laden all the way up until 9/11. Dude, its all about who's controlling the opium trade there, plus the natural gas and oil. I have to disagree with Stanislav's assessment. I am currently serving with the NATO Training Mission-Afghanistan (www.ntm-a.com) and know he is way off the mark. He is obviously not an expert on Afghanistan and has probably never even been to this country. The Afghan people want their government to succeed. The fact that they kicked the dysfunctional Soviet Army out of this country is no suprise to anyone. I believe in the future of Afghanistan and as literacy rates rise from more of their young attending school then the dynamics will change drastically in this country. I had the pleasure to attend this ceremony and have to say it was a good day to be in Kabul! 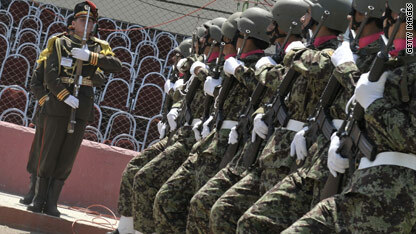 I am proud to serve with the Afghan Army and Police and know they will succeed in the long run. This is an Udder disgrace to all people in the nation of Afghanistan. the Reason why The Taliban was the terrorist organization who was supported by the United States Government. Osama Bin Laden was trained by the CIA to help the Taliban try to beat the Soviets. What The United States didn't understand is that to Se up a stable government in Afghanistan is like trying to put an inflated ballon in the bottom of the Ocean and expect it to remain their. The Soviets were trying to establish a government that was more stable than any government that that a terrorist organization could provide for the afghan people. The United States is trying to bring democracy, or so they say, to the war torn Afghanistan (Establishment of a stable government) but its not working because the Afghan people are like chickens and will follow any group of people that will offer the protection of their heroin cultivation or food. They should be ashamed hat they choose oppression over freedoms.